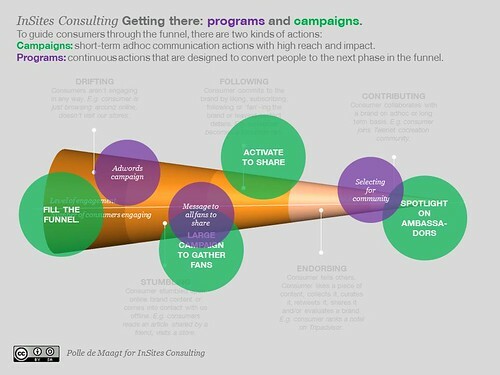 Campaigns AND programs in conversation management » Acts, not ads. Both Twitter and Facebook force companies to think beyond campaigns. Whether they want it or not. The infrastructure of both social media powerhouses is designed in such a way that favors small interactions between brands and consumers over large campaigns efforts. Where Facebook requires brands to constantly interact with consumers in a relevant way to make sure brand messages keep turning up in the Facebook news feed, the short life span of a tweet forces brands to have a continuous presence on the platform. Consumers expect to be treated like a person, not a cash dispenser. It’s pretty annoying that a brand only starts communicating when they need you to renew a subscription or when they need you to buy their products. That means there needs to be a more continuous stream of interactions. Consumers have a new hygiene level. Every time KLM helps a customer via Facebook or twitter on a saturday, sunday or in the evening, every time Rabobank’s conversation manager Robert Lommers replies to a twitter discussion and every time I have a hassle-free experience in one of my favorite online tools CardCloud, Yunoo, Tungle.me, Gist or Evernote, it raises the bar: there’s a new ‘expectations-normal’, a new hygiene level. Of course that means brands should adopt proactive and reactive conversation management. Campaigns are intense efforts with high reach and high impact during a limited amount of time. Campaigns are great to give a sudden boost to awareness, knowledge, behavior, likes, followers, friends or other connections. Programs are small interactions between brands and consumers throughout the year that have the purpose to gradually engage consumers with the brand. As pictured above: brands should not rely solely on a limited amount of campaigns during the year, but adopt a more gradual approach. A gradual engagement approach where small interactions between brands and consumers throughout the year create a stronger connection. No, it isn’t rocket science, but requires brands to loosen their strict campaign planning and adopt a more liquid and permanent approach. Skittles is extremely smart in using posting small, brand-coherent pieces of content, like the piece here “How would would you store and protect one million Skittles? It’s sort of an emergency”. A highly likeable and shareable piece of Skittles content (proven by the fact it received over 8000 likes and over 4500 comments). Instead of merely doing Facebook campaigns (which they do, to drive awareness and increase their number of followers), this approach makes sure they interact with at least a part of their Facebook followers on a regular basis, gradually engaging, and making sure they keep popping up in user newsfeeds. Note: thanks to my dear friend Jourik Migom (former Boondoggle Agency, now Walking Men), who opened my eyes for the concept of brand programs. What about platforms? How do you see the integration of social media into platforms like Nike+ and the recent Nokia/Burton Snowboard efforts?